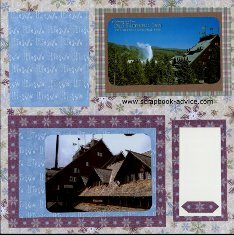 In the Yellowstone Park Scrapbook #2 I have added some layouts of The Old Faithful Inn, the original Inn at the Park built in 1903-1904 and designed by the Architect Mr. R. C. Reamer of Seattle, Washington. It is said to be the World's largest log structure. Architecture? No! It's Called Parkitecture! The lobby of the Old Faithful Inn rises 8 stories and provides nearly 4100 feet of open floor space for guests. 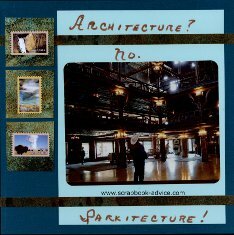 The style of Architecture used by Mr. Reamer has been used in other Park structures and has affectionately been called Parkitecture. Here I used a dark aqua cardstock for the background and light aqua for the photo mattes and some patterned paper with the look of stone - all from the Club Scrap.com Special Edition Kit from 2011 called Lodge. Left Page - The three postage stamp type stickers in the left were from a group of stickers I picked up at the Park and show Tower Falls, Mammoth Hot Springs and of course Old Faithful. 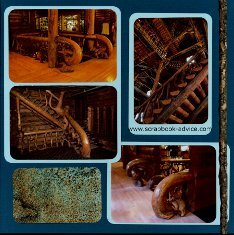 Right Page - These are photos of the Lodgepole Staircase, made from the twisted and gnarled branches from the Lodgepole Pine that was infected by a bacterial disease. Many other uses of these infected branches can be seen throughout the Park and as I understand it, when the work was being done, searches were made for pieces that were matching before they were added to the final construction. Left Page - The Chimney in the center of the Inn was formed by 500 tons of hand quarried lava blocks. It stands 80 feet high and actually has 8 different fireplaces. The sunken area in front of the made for a cozy space and the fireplace had that beautiful fire screen with the image of Old Faithful. Wrought ironwork was done by George Wellington Colpitts. With snow on the ground and no place to go, I was quite content to sip hot chocolate and watch the fire for a while - a great time to remember from my Yellowstone Park Scrapbook. Right Page - This layout shows photos of the 20 foot wrought iron Clock on the Chimney which was just above the fire where I was sitting. I thought the American Flag was a nice touch as well. Bottom Left - Outside of Old Faithful Inn - Wyoming Travel Magazine. 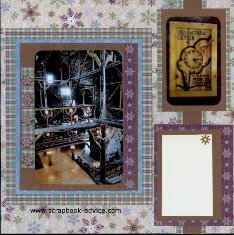 For both of these layouts, I used layered papers and embellishments from the Personal Shopper November 2011 Kit. There was an wonderful combination of the border paper with the light blue swirls and snowflakes. On top of that I used a light blue print, then a brown and green plaid accented with a dark red, both from the collection called "Winter Flannel" and also a piece of Silver Color Me paper with more snowflakes. I thought the combination of crisp white and silver snowflakes and the warm inviting colors of the flannel look were a perfect combo to the snow outside and the warmth of the fires burning inside the Inn. Embellishments included two blue tags, purple and blue fibers and a large blue Brad Buddie Snowflake attached with a Pink Brad. Left Page - The Old Faithful Inn's unique Architecture is very interesting. Looking at the Inn from the outside, each window is different, as are the dormers. The individual panes of the windows in the gables are different from window to window - some square, some rectangle, some diamond shape and different sizes. The architect felt this would reflect the fact that nature has no geometric symmetry. Right Page - This layout shows photos of the Old Faithful Geyser Eruption Prediction Clock along with a photo of the Lobby from the Second Floor Balcony. About the Clock - Old Faithful is never wrong - only the Clock is wrong. Geyser Prediction Clock - Mine. 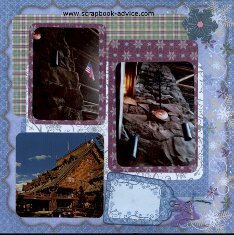 For both of these Yellowstone Park Scrapbook layouts, I used papers and embellishments from the Personal Shopper November 2011 Kit. More of the combinations of the Winter Flannel and some light blue with "Let it Snow" in white whimsical lettering. For some of the photo mattes, the snowflakes have been cut from the red paper and added to the plaid paper with pop dots to provide some depth. Each of those has been accented with a gold star dazzle. 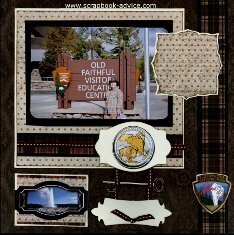 Left Page - These Yellowstone Park Scrapbook Layouts show The Old Faithful Visitor Eduction Center which opened August 25, 2010. I knew it was going to open, but had planned my trip without giving the date any thought, and I drove into the Park my first day - the day it was opening. It was a very daring move as I did not have a reservation, but was lucky enough to get a place due to a cancellation. The education center was awesome and I could have spent a week there learning all about the thermal activity around the Park. 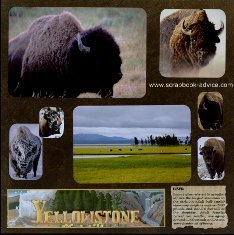 For both of these Yellowstone Park Scrapbook layouts, I used papers & embellishments from the November 2011 Personal Shopper Kit. I thought the masculine dark browns and plaids with the tan made a nice backdrop for the colors in these photos. Most of the layout design was from the Personal Shopper Kit newsletter. I adjusted the sizes of the mattes to accommodate my photos and stickers. 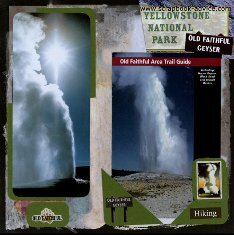 Embellishments include 2 stickers of Old Faithful Geyser from the Yellowstone Park Scrapbook Kit at the Bookstore. A photo of the first America the Beautiful coins showing Old Faithful and a Bison represent the fact that Yellowstone National Park was our first National Park. The Gold Key attached to the frames with a brown ribbon, represents the opening of the Education Center. Other embellishments include the plaid paper ribbon strips and an elaborate Die Cut of Old Faithful that I got from Scrap Your Trip. 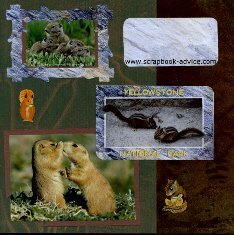 Both Pages - These Layouts from the Yellowstone Park Scrapbook use post cards and the Trail Guide for the photos on these pages. For both of these layouts, I used background papers from the Yellowstone Park Scrapbook Kit I ordered from the Bookstore and a sheet of Green Card stock to match the green on the Die Cut and one of the photos. The stickers and stamp images were also from the Kit. 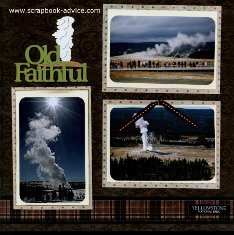 The Old Faithful Geyser Die Cut was from Scrap Your Trip. 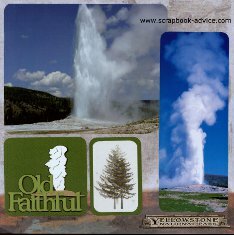 Left Page - The Yellowstone Park Scrapbook Layouts here show more views of Old Faithful including the Left Page Background Paper which came in the Yellowstone Scrapbook Kit from the Bookstore. 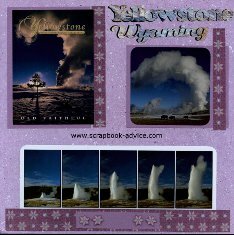 Right Page - More photos of the Old Faithful Geyser from purchased post cards. Since I had the Left Background paper with the Pink tones of Old Faithful from the Bookstore Scrapbook Kit, I found a matching Pink Sponge Paper for the Right side in the November 2011 Personal Shopper Kit. Also in the kit was the red with snowflakes from the Winter Flannel collection that I used to accent around the photos. I had a few small pieces left over so I cut out the snowflakes and added them with pop dots to the strips. They show up best just below the series photo. 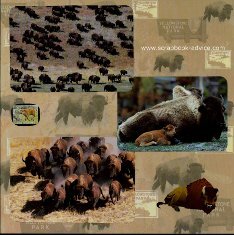 The Title for these pages was die cut from a granite like paper and came with the Yellowstone Park Scrapbook Kit. Check out the Live Web cam of Old Faithful. 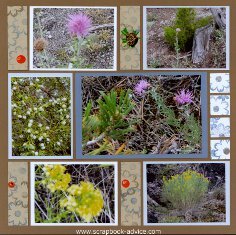 Both Pages - Here in the Yellowstone Park Scrapbook Layouts I show off the beautiful Wild Flowers found in the most harshest places around the park, near the Geysers, Fumaroles, Mudpots and Hot Springs. These beautiful flowers were growing out of Granite Rock amidst the steam and chemicals generated from the Thermal Activity. The layout was from a Mosaic Moments Scrapbook Page Kit I picked up from Tami Potter's class at the CK Convention in Charlotte NC in August 2011. For this class we made a background paper using Tami's stamps. 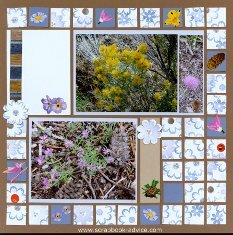 In addition, I added small flower stickers to the solid pieces of the mosaic.Click on either of the photos to check out more of Tami's amazing Mosaic Moments Page Kits. The Journaling block on the right will show a list of the flowers by name. 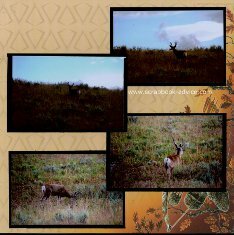 Both Pages - The Pronghorn are some of the beautiful mammals in the Park. They are the fastest runners on the continent reaching speeds up to 50 mph so I was lucky they were grazing so I could get these photos. 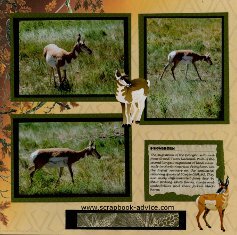 The photos are all mine and I added in some stickers from The Yellowstone Park Scrapbook Kit and a journaling block that tells about the Pronghorn. The background paper is called Bow Hunter from J. W. Outdoors Scrapbook Collection licensed by Sugartree. I purchased it at the local scrapbook store in Cheyenne, Wy. 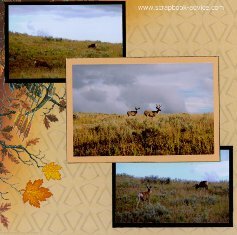 Both Pages - These beautiful deer certainly cooperated with the photographs and as the slowly walked up the hill. I was pleased that they turned to pose for me to get these great shots. 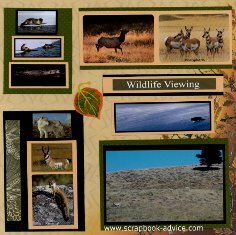 For these Yellowstone Park Scrapbook Layouts, I used the same Bow Hunter paper from the previous layouts, and added only dark brown and yellow photos mattes to offset the pictures. Both Pages - I was lucky to come across these cute little chipmonks feeding and ignoring all the people around them. I also had several sightings of Prarie Dogs and lots of Squirrels. Aside from my own photos, I added in two postcards and some stickers from the Yellowstone Park Scrapbook Kit from the Bookstore. The card stock background was from the Club Scrap Special Edition Kit called Lodge accented with frames and granite journaling blocks from the park Kit. 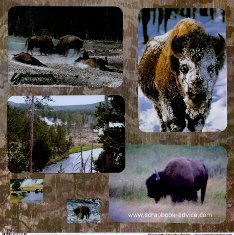 Both Pages - These awesome Buffalo were quite prevalent all around the Park and made it easy to get some great photos. Far from the Buffalo population numbering in the 20's back when I first saw one in the park in 1963. It is wonderful to see how their numbers are growing. The close up photo of the buffalo on the right page was taken as he approached my car that was blocked in by traffic. He eventually decided to scratch himself on the front bumper of my car and I could feel the car shifting from his 2,000 pound weight. Thankfully it was not a good scratching spot so he soon left. Aside from my own photos, I added in some stickers, a journaling block and a Title from the Yellowstone Park Scrapbook Kit. The background paper on the left is from Scrap Your Trip is called Yellowstone National Park and is paired up on the right with a dark brown cardstock from my stash. All photos and stickers had the corners rounded with a punch. 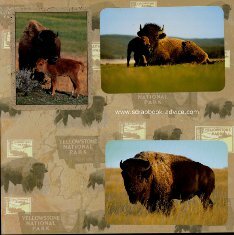 Both Pages - These two pages from the Yellowstone Park Scrapbook all use post cards that I purchased at various locations within the park. 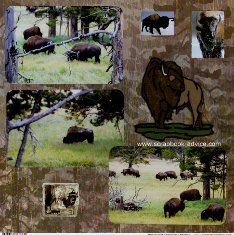 The background papers I picked up along the way and show the buffalo and the Yellowstone National Park signs. 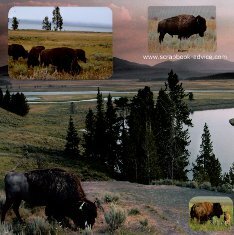 Both Pages - Hayden Valley Buffalo sightings form these two pages from the Yellowstone Park Scrapbook mix my photos with 2 post cards that I purchased in the park. While I did not see any Buffalo in Fighting Mode, I did see a number of them rolling in the dirt and the places they left in the ground were called Buffalo Wallows. The background papers came from a Scrapbook Kit I picked up along the way. I used a few small stickers from the Kit as well and a Die Cut of a Buffalo I purchased from Scrap Your Trip. The larger photos had the corners rounded with a punch. Both Pages - Some photos here of the Lake Lodge, inside and out, including Ducks on the Lake and a scale model of the Lodge itself. These photos were taken during late afternoon when the temperature was in the high 80's. After unpacking the car, the stormy weather was coming in across the Lake and within 20 minutes it was windy with snow and then sleet and near freezing. 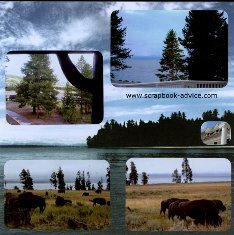 Both of the background papers of the Yellowstone Lake were purchased from Scrap Your Trip. 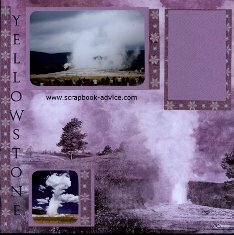 I hope you have found some useful tips here in the Yellowstone Park scrapbook. 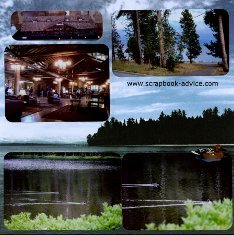 I mixed my own photos with post cards and photos from brochures and found a lot of nice stickers and embellishments in the Yellowstone Scrapbook Kit. Mixing those papers with others from my stash and more from Scrap Your Trip, Club Scrap, Mosaic Moments and Personal Shopper I was able to take single page backgrounds and stretch them to make some matching 2-page layouts. You don't have to stick with just one manufacturer of products to make you layouts work nicely with your photos. or the Road Trip Scrapbook for more great ideas. 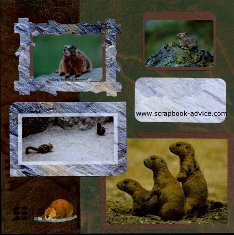 to see more than 70 other themed scrapbooks. 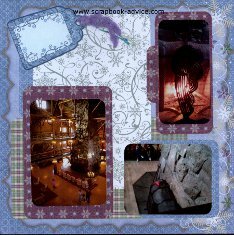 Go back to Home Page for general Scrapbook Advice.